Q: Are these pipelines supplying (a) water, (b) energy, or (c) both? What does this mean for energy efficiency and greenhouse gas emissions? 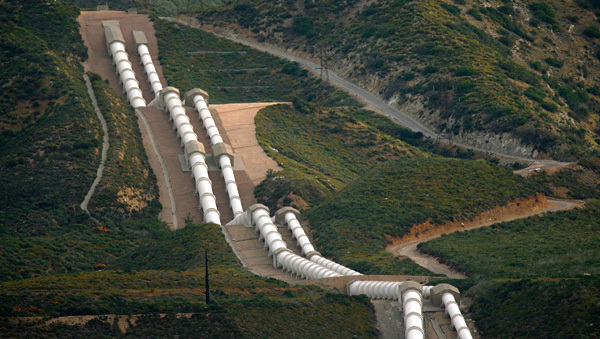 This is the first of two posts that describe the water-energy nexus in California. The second post will focus on the water-energy nexus at the San Diego regional level. In general, the water-energy nexus refers to how energy is consumed and embedded within the water use cycle. The CEC uses the chart below to explain the key energy-consuming steps in the water use cycle. 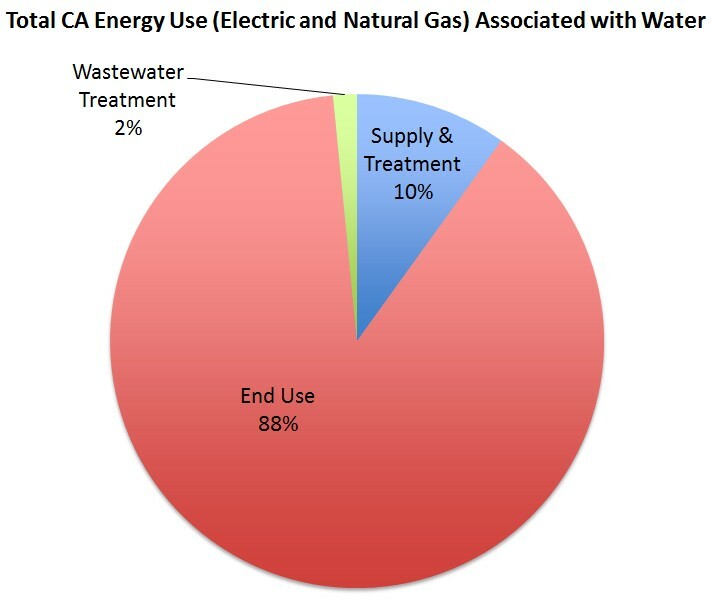 Energy use within the water industry is typically separated from energy use by the water customer, known as end-use (green box below). End-use represents the amount of energy used by the customer for heating and pumping water in a home, office or facility. The CEC estimates that about 19% of total electricity and 30% of non-powerplant related natural gas is used in the following segments: (1) transportation and treatment of water, (2) transportation and disposal of waste water, and (3) end-use heating and consumption. Of this 20% of total electricity and 30% of non-powerplant related natural gas, end-use accounts for about 62% of electricity and 99% of natural gas use. Stated differently, for many Californians, upwards of 88% of energy use within the water-energy nexus is associated with the residential and commercial end-use segment. End-use represents roughly 88% of the total energy use, by far the largest component of the water use cycle. Accordingly, end-use has the greatest potential for water and energy savings through efficiency measures. Energy and greenhouse gas policy considerations make it useful to consider energy consumption by energy type. 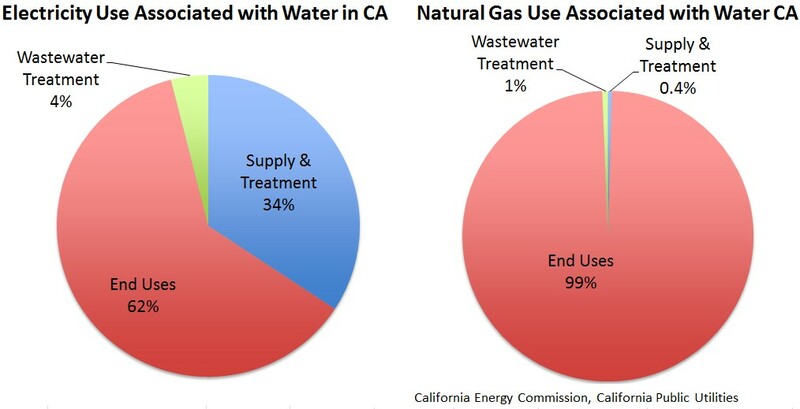 The graph below shows, as stated earlier, that of the 20% of California’s total electricity and 30% of California’s non-powerplant related natural gas, end-use residential and commercial water demand account for about 62% of electricity and almost 99% of natural gas use. The energy intensity of each segment within the water use cycle is typically represented in kilowatt-hours per million gallons (kWh/MG) of water. The table below shows the energy intensities representing the fundamental elements of the water-energy nexus, excluding end-use, throughout northern and southern California. Note that water supply and conveyance represents the segment with the the largest difference in energy intensity between northern and southern California. This is a consequence of the extraordinarily long distances water must travel to reach otherwise dry and arid parts of southern California. The various energy intensities of the water use cycle segments show the opportunity for energy efficiency improvements on a large, state-wide scale. 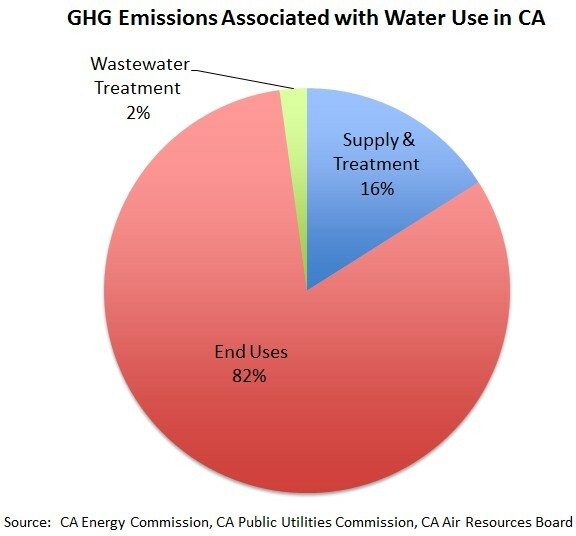 For example, while water treatment facilities are vital and serve many useful ends throughout California, the opportunity for future efficiency gains within existing water treatment facilities are far outweighed by the water supply and conveyance, water distribution, and wastewater treatment segments of the water use cycle. The average energy intensities of the water use cycle segments shown above represent a wide range of values found throughout California. 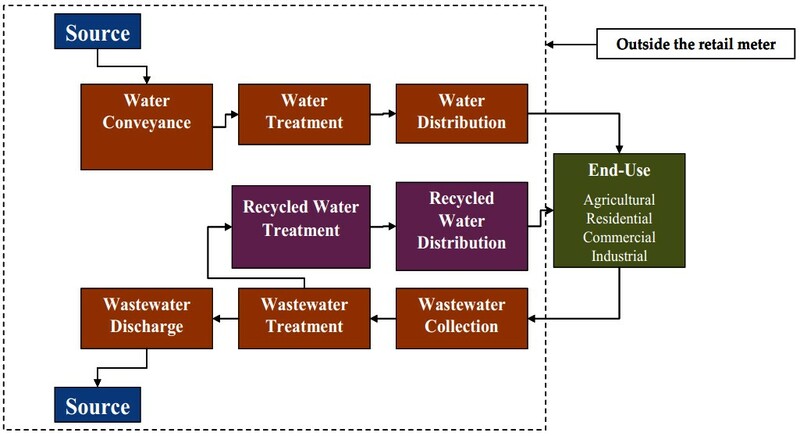 The range of energy intensities for each of the water use cycle segments, before losses are considered, is shown below. Embedded greenhouse gas emissions attributed to the various segments of the water use cycle result from combustion of fossil fuels used during electricity generation or while harnessing and consuming natural gas. Accordingly, the charts showing greenhouse gas emissions and energy intensities of the segments of the water use cycle look similar. Again breaking down the emissions by energy type, we see that emissions associated with natural gas consumption occur almost exclusively at the end-use segment, and emissions associated with electricity are highly concentrated in the supply and treatment segment of the water use cycle. 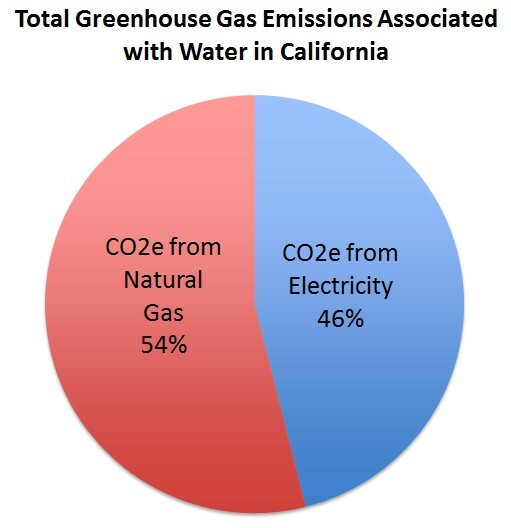 In California, natural gas consumption associated with water use produces slightly more overall emissions than electricity. As initiatives like the Renewable Portfolio Standard improve and continue to use renewables to produce cleaner electricity, the fraction of emissions associated with natural gas will continue to grow. Further, considering that almost all of the natural gas consumption within the water use cycle occurs at the end-use stage, it remains clear that the greatest potential for energy savings as well as greenhouse gas reductions exist within the residential and commercial end-use sector. For a more indepth look at the water-energy nexus in California, please see the following study: Navigant Consulting, Inc. 2006. Refining Estimates of Water‐Related Energy Use in California. California Energy Commission, PIERIndustrial/Agricultural/Water End Uue Energy Efficiency Program. CEC‐500‐2006‐118. This brief primer on the water-energy nexus provides a background on how energy moves water in California. In Part II of this series on the water-energy nexus, we will be exploring the issues associated with the water-energy nexus on the San Diego regional level. c) When water flows down the slope towards our homes and facilities, it is used to generate hydroelectricity. This entry was posted in Energy, Energy Efficiency, Renewable Energy and tagged Distribution, Energy Intensity, kWh/MG, Nexus, Supply and Conveyance, Treatment, Wastewater, Water, Water-Energy Nexus. Bookmark the permalink.